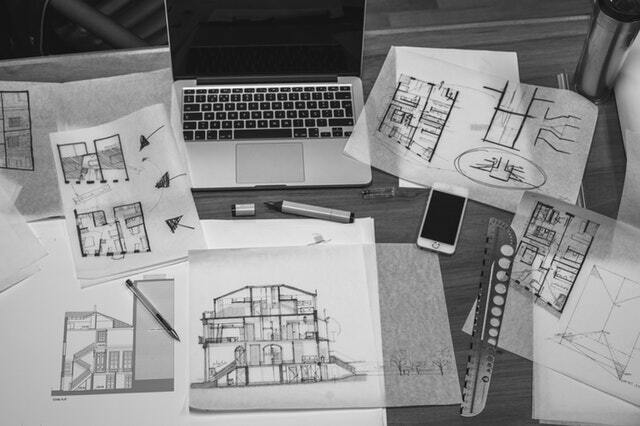 Reading an architectural plan can be difficult at first glimpse, however looking at the overall layout focusing on the wall and runs first is necessary to get you started. You look at the big picture first, then you gradually look at the doors, windows, room names and systematically you move down to the details. At this point, you can then look at the dimensions that the architect has denoted on the architectural plan so that you can read the sizes of the spaces you are looking at. Architects have been using this process to design and show spaces for many years. Next, you can then look at the meaning of the symbols used by going to the symbol index usually located on the cover sheet. That way you have a reference point that will guide you to their meaning. An architect uses this to convey information without crowding the plan view and keeping the architectural content simple and easy to read for the viewer. By using these links, you can navigate to all areas of the plans you are reading. By looking at let's say the first floor plan, you can see a detail call out on one of the walls shown on the floor plan and by looking at what that says, the sheer number and the detail number together will direct you to that area of the plan and see what information is available for that particular wall and what information is necessary for the construction of that wall. Other information is required for that wall such as the kind of stone used, plaster used or other material that is noted for that particular wall will be there for the reader's information. This could also be done with a bathroom plan, bedroom plan, kitchen or other spaces that require specifics to that room or area. Also, by using these links it ties the whole floor plan and other drawings set together in specific ways to convey the design with the architectural content simple in the layouts shown in the construction documents. For clarification, please keep in mind that the construction documents comprise the contracts, emails, drawings, designs, sketches, all printed documents, etc... As part of the package. It is all comprehensive and it all becomes a legal document for the implementation of the contract for construction which is what these plans have become. However, as I digress still keep in mind that this is a systematic way of reading an architectural plan and if one is able to understand and use this skill, a great amount of pleasure can be derived from time to come. Enjoy!